ACT in Context: ACT in Context will take listeners on a journey from the history and development of ACT through its clinical application and the future of the work. This podcast will primarily focus on ACT, but it will often touch upon several related issues such as behavioral principles, the underlying theory of language (Relational Frame Theory) and philosophy of science. We hope that informal learners, potential consumers, researchers and clinicians alike find it useful. Psychologists Off the Clock: Ever wonder what therapists talk about over coffee? We are three clinical psychologists who love to chat about the best ideas from psychology. In this podcast, we explore the psychological principles we use in our clinical work, and bring you ideas from psychology that can help you flourish in your work, parenting, relationships, and health. ACT: Taking Hurt to Hope: Life’s challenges are diverse. They may be circumstantial or broad-based. Suffering and lack of momentum are common results of life’s ups and downs. JoAnne Dahl will help guide listeners to spend less time with their problem and more time focusing on ‘values’ based action as in Acceptance Commitment Therapy. Opinion leaders from a variety of modalities will join JoAnne for candid discussions focusing on general principles for living as well as specific solutions for difficult problems. Functionally Speaking: Functionally Speaking is a podcast more adequate for the challenge of the human condition. Dr. D.J. Moran hosts this podcast for people interested in issues related to modern clinical psychology. 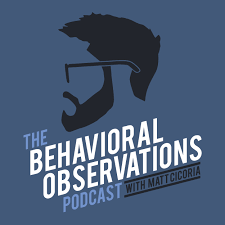 The Behavioral Observations: The Behavioral Observations Podcast with Matt Cicoria is an interview-based show that features conversations with innovative scientists and practitioners in the field of Behavior Analysis. The podcast covers topics such as Autism, Functional Behavioral Assessment, Acceptance and Commitment Therapy, Functional Communication Training, Verbal Behavior, and more!